SQL Server 2005 Broker Service: MSMQ, WCF, Biztalk! I got a chance to plumb with MSMQ way before I worked with SQL Server 2005. And recently, while reading a book and couple of articles, I played around with SQL Server Broker Service; and it was fun. And the question that jumped around my mind was how could we use Broker Service, if at all possible, with WCF; and then why would we ignore MSMQ over Broker Service. Well, thought... I should have these thoughts documented somewhere. First, the Service Broker is one of the powerful features that comes with Microsoft BI Product Suite. Initially, I "overlooked" service broker which gives the SQL Server power to build reliable/distributed apps - and by apps I mean, the service broker can turn SQL Server into a platform. Imagine database talking to each other, performing transactions, taking decisions, releasing notifications, all by themselves. Since service broker is built into SQL Server, I found out that service broker messaging has some significant advantages over MSMQ transactional messaging - and performance being one of them. The maximum Service Broker message size is 2 GB; The maximum MSMQ message size is 4 MB - memory constraint. Service Broker activates another queue reader process only when the current processes aren't keeping up with the load, while MSMQ triggers fire for every message that arrives - again process intensive. Service Broker messages can be processed by any application that can establish a database connection to the SQL Server database. Applications that process MSMQ transactional messages must run on the same physical machine as the queue. Service Broker can commit updates to the message queue, database data, and application state in a simple database transaction. MSMQ requires a two-phase commit to do the same thing. While MSMQ may be beneficial when you would require both TCPIP binary protocol and HTTP SOAP protocol for communications. Like for instance raw processes over sockets as well as web services. Because service broker is binary TCP/IP only in SQL Server 2005. Or when you would want to communicate across different windows apps - independent of SQL Server database. Service Broker and BizTalk may not have a lot in common but service broker can reliably deliver a message to another SQL Server instance with exactly-once in-order(EOID) assurances. Besides providing this functionality, BizTalk, in addition can manipulate the contents of messages, map message formats, manage message processing, manage workflows, manage states, send messages over multiple different transports. If your application doesn't use any of these features and just requires reliable delivery from one SQL Server instance to another, Service Broker is probably a better alternative. 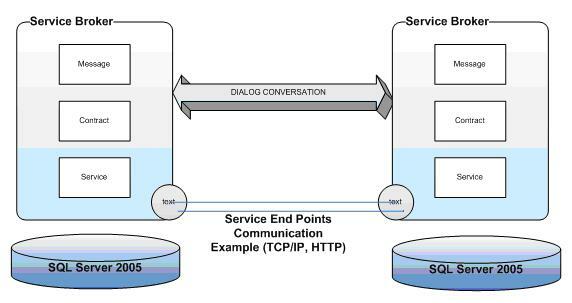 Windows Communication Foundation supports many messaging styles over a variety of standards-based protocols between Windows and any operating system that implements the standard protocols that WCF supports.Which includes, but not limited to, TCP/IP, UDP/IP protocols. Here is how I got started. If you like reading, then this article has some food-for-thought about the technology and may help. Akram Hussein has actually provided an step-wise example.Look here for tutorials. DISCO(read: Discovery) is a technology that Microsoft introduced in .NET, that facilitates the capability of Web service clients to discover Web services and their associated WSDL(read: wizdil) files. .DISCO and .VSDISCO files are separate from UDDI. While UDDI, which is rapidly evolving as a standard, goes beyond DISCO by defining how to interact with a full-fledged Web Service information repository, DISCO files are still in use. The .DISCO and .VSDISCO files provide alternative ways to discover Web services that preclude the use of UDDI. And if UDDI is in use then .DISCO and .VSDISCO files do not. When a web service publishes a static discovery (.DISCO) file, it enables the programmatic discovery of that web service. A .DISCO file defines what files to search; whereas a dynamic discovery (.VSDISCO) file simply identifies which directories to skip. This results in the discovery of the services that exists at that level and below the virtual directory that contains the document. A .VSDISCO file is intended to be requested by the browsers/clients over the web. If you do not want unintended-clients to be able to discover services that are not implemented for them, then do not place .VSDISCO files in the webservices directory. Using .VSDISCO files benefits developers in several ways. These files contain only a small amount of data and provide up-to-date information about a server's available Web services. However, .VSDISCO files generate more overhead (i.e., require more processing) than .DISCO files do, because a search must be performed every time a .VSDISCO file is accessed. Well, eventually it seems like there is no purpose to DISCO/VSDISCO files since UDDI is not actually used. Probably initially it did sound like a good idea but is not "that" usable; because actually or usually a client learn that a web service exists is because someone tells the URL of the WSDL file. It may probably help in future when everything is going to be service oriented. Every functionality over the web; when Grid Computing would be a smalltalk in IT industry. An in-depth article by Aaron Skonnard is worth the time. And also, he tells about the reason why did .VSDISCO documents stop working with the final release of the Microsoft .NET Framework. This tutorial is an excerpt directly from Dietel. Seldom we find a need to dig inside a technology and know it inside out. HttpHandlers is a similar interesting topic and I plan to write about in future; lets see when it comes out. Though above did come handy as a solution, but it was full of surprises as well. The "con" that comes along is something that your application may not desire/intend. For instance, in cases where you, lets say, are designing a page that performs an online bank account transaction; and along with other forms' elements you also have a "Submit" button, that gets disabled after you click it; precisely to avoid duplicate transaction. You click on the submit button and the application throws you on to a next page that has this "<< Go Back" link. Now your spine may get a shiver or two to know that after coming back to the orignal "online-transaction" page, your "Submit" button is disabled. Now WTF? It is because, usually, when a Form gets validated, we tend to disable the Submit button to avoid multiple hits; Specially in cases of online/form based transactions. 1. Use Back Button where validation is not being performed. Or there is no Form/elements. 2. Use AJAX for on-the-fly validation, and show validation messages on the same page. 3. Use Server.Transfer(Url) to go back.